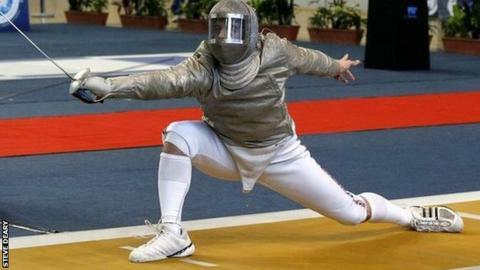 Six Truro Fencing Club athletes have been chosen to represent Great Britain at April's World Youth Championships. In the boys' team, Charlie Dean will compete in the epee, while Will Deary, Josh Maxwell and Fraser Woodburn make up the entire Under-17 sabre team. Caitlin Maxwell is picked for the girls' sabre, with Yvonne Chart selected in the foil. "I think a number of our athletes have a realistic chance of a medal," Truro head coach Jon Salfield told BBC Sport. Truro are the only British club to have fencers selected for the Championships in all three disciplines of the sport: foil, sabre and epee. "We've had athletes picked for European and World Championships before but it's the first time we have had such a big number of fencers picked," added Salfield, who also coaches the GB men's sabre team. "It is not only evidence that we can find talented individuals but that there is a program that can develop a whole host of athletes across the three disciplines." The boys' sabre team have already achieved international podium finishes this season, including a surprise victory over the Russian national youth team on their way to a silver medal at the Godollo international event. Deary, 16, is the current Under-17 British champion and will be entering the World Youths ranked fourth in Europe, after winning a European circuit event last October. "Some of our fencers have plenty of time left in their age groups, so will be going more for the experience and will be hoping to medal in future seasons but I believe some of our fencers have medal chances this time around," added Salfield. British Fencing will be particularly hoping for success in the sabre discipline after recently receiving increased UK Sport funding. The discipline received almost £750,000 for Olympic potential athletes for the next three years, to begin the development of the team for the Tokyo 2020 Olympics. "If you look at the history of sabre in the UK it has not been our strongest weapon, but over the last few years it's really changed and it's building very quickly from the young age groups all the way up to senior level," said Salfield. "I think it really could be a game-changer for the discipline in the UK, in terms of funding, performance and participation in the sport." Before the Worlds begin on 3 April, the fencers will first compete at the European Youth Championships in Israel from 22 February.